November is the month that we pay homage to the great giallo horror films and soundtracks of yesteryear. Think Goblin, Argento, and Bava; the iconic lighting and makeup not to mention the downright twisted stories told! Come experience the darkest delights as we bring Australia’s master of horror to play live supported by three ghoulish selectors to make you dance with the dead until dawn! 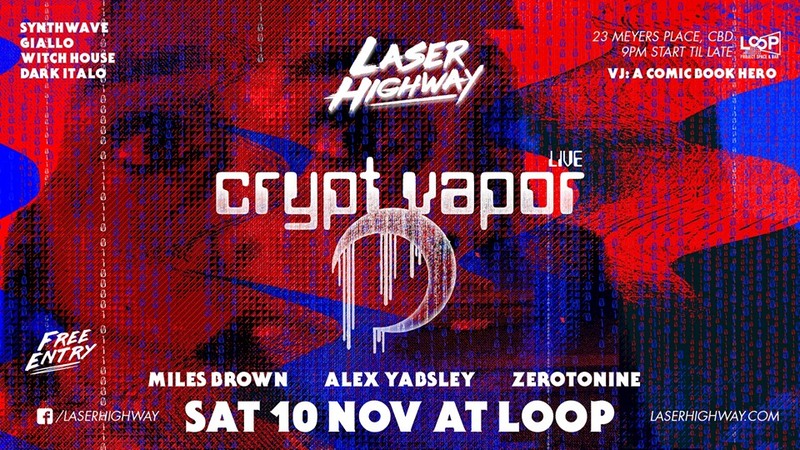 Laser Highway is Australia’s premier night located in Melbourne dedicated to the very best synthwave, italo-disco, outrun, retro electro, 80’s jams, games, and anything else firmly with its roots in synthesizer-based music to keep you grooving into the night! We’ve cultivated a culture that takes inspiration from the 80’s and 90’s, cyberpunk, vaporwave, deep reds/purples/blues and a bunch of sci-fi/action movie tropes into a clash of exploding sound and colour. Laser Highway is a monthly event featuring an incredible sound system, laser light shows, projection art, cocktail list, a big screen multiplayer game space and a pounding dancefloor to transport you to your retro home away from home. We’ve prided ourselves on creating a radically inclusive alternative club night to give you an experience that’s all about those thumping beats, synthesized basslines, good times and a touch of nostalgia and camaraderie from your past, present and future friends that you haven’t yet met. The enigmatic producer from parts unknown within Tasmania is making his Laser Highway debut bringing his unique twist on the horror synth genre inspired by soundtracks of films like Suspiria, Deep Red and Demons with a touch of John Carpenter’s work. Witness him craft a retro horror movie soundtrack that does not exist (yet) before your very eyes and ears! Miles Brown is a leading Australian thereminist, composer and sound artist. A student of Russian theremin queen Lydia Kavina, he is known for his work with Melbourne instrumental electronic act The Night Terrors, and has performed with renowned artists such as Lou Reed, Laurie Anderson, Goblin, Black Mountain, Mick Harvey and Heirs. Miles’ solo material explores the theremin and analogue synthesiser in the realm of dark dance and ethereal electronics. Miles also is involved with gothic/industrial/post-punk club night, Cult Locker where he regularly plays live or spins evil DJ sets bringing some of that flavour to our stage. A music obsessive who hopes to one day listen to all the music, he has been exploring the intricacies of electronic music sub-genres for years and occasionally is on the radio (Triple R) or Podcast (Genre Cult). At Laser Highway Alex gets to indulge in his favourite hidden 80s relics, pop classics and modern retro everything. He had too many aliases so decided people should just call him by his name. Zerotonine is the host, resident DJ and runs Australia’s first and only monthly club night dedicated to synthwave, outrun and retro electro: Laser Highway in Melbourne. As a labour of love, he is dedicated to providing a unique experience for music makers and fans alike. He is also the co-host of www.kissfm.com.au‘s (87.6 in Melbourne) Retro Electro Show from 2pm Wednesdays AEST. A veteran DJ and creator for over a decade playing too many genres internationally and at home in Australia, he is in love with arpeggio basslines, warm synths, and driving drums; his style is inspired by 80’s movies, the Lamborghini Countach, boss fights, neon vectors, keytars, androids, reverb guitars, gated drums, cosmic phenomena, bleeps and bloops. Expect a range of sonic styles to get your feet stomping and head rocking from all corners of the retro-verse. We acknowledge that this event takes place on the traditionally owned land of the Wurundjeri people of the Kulin alliance, to whom sovereignty has never been ceded, and we pay our respects to their Elders past, present, and emerging.